This past weekend I fulfilled one of my dreams. You see, I already live in Italy, so from most people's perspectives, my life is already a dream. With that in mind, you can just imagine how high the bar has been raised on my forever growing Bucket List. Although I live in Liguria, Tuscany calls to my heart, soul and palate. I won't deny that I much prefer a yummy pasta with wild boar sauce and a fine Chianti than pesto and foccaccia, but I digress. Amidst the rolling Tuscan hills, my destination was the Cashmere Goat Farm in Radda in Chianti. 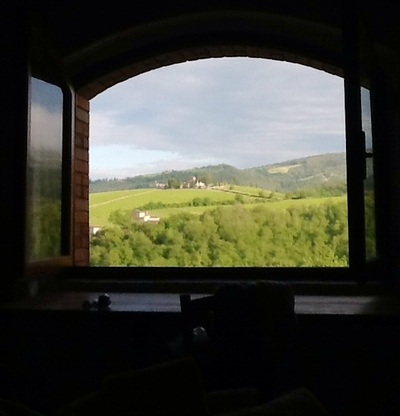 Located a mere 20 Kilometers from the famous villages of Volterra and San Gimignano. 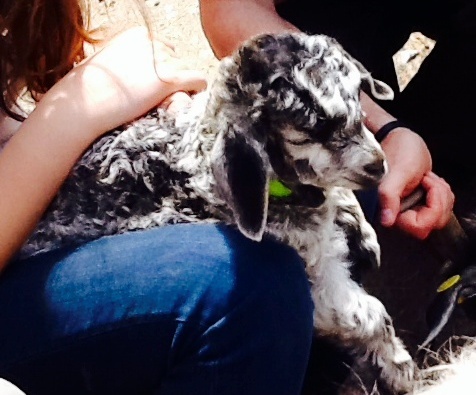 My host was American born Nora Kravis, whom I have since nicknamed the "Goat Whisperer". 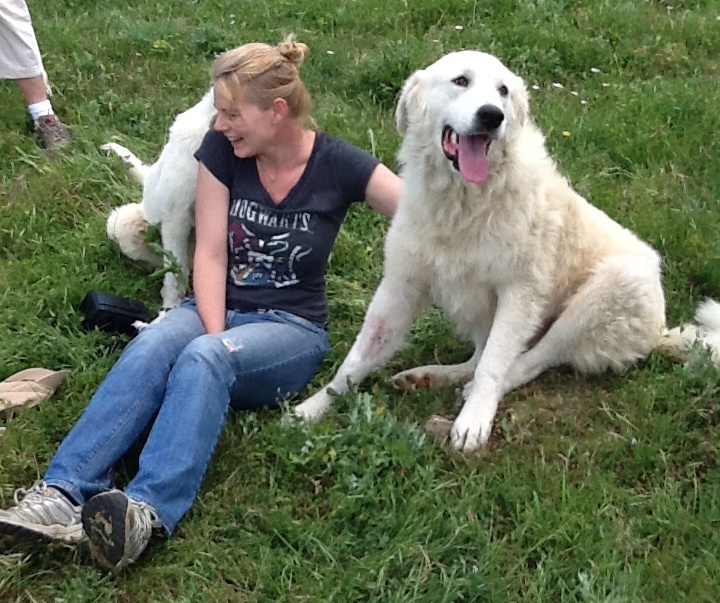 Nora is a veterinarian, entrepreneur and passionate animal lover. She has around 14 Maremma-Abruzzese Sheep dogs, 5 of the most adorable and affectionate Bolognese dogs and 160 Cashmere Goats with a new herd of 100 kids and counting. She owns a huge property to take care of them all and does this all single-handedly. I'm exhausted just thinking about it but Nora's passion is exuberant along with her warm sincere smile. I first met Nora in an expat group I belong to online. 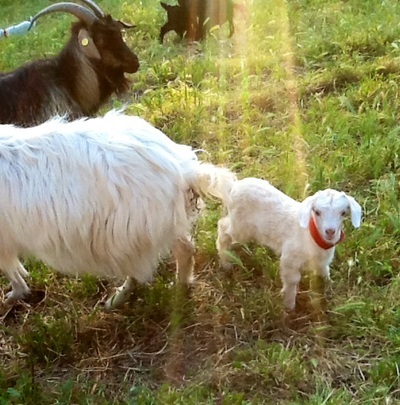 At first site, I knew I had to visit her Agriturismo where she raises cashmere goats. Immediately, it got added to my Bucket List but for a few years now it seemed like it would never happen. I kept seeing these beautiful photos of cashmere scarves and blankets and these darling little kids being born in Springtime but wondered when I would ever be able to get there. Finally, this weekend I arrived with my husband in tow. I would like to point out here that my husband is only home for six weeks. He works abroad for 4-5 months and our time is very limited and precious to us and so there's a lot of pressure to get everything 'just right and stress free'. This experience has been everything I expected and so much more! The moment Nora greeted me I felt like we were old friends. I was so excited that I quickly changed into my torn up jeans and hiking shoes right in her driveway and then enthusiastically followed her down the hill from our rental house. Under the fading sun, perched on a grassy hill, Nora placed a kid in my arms. My heart melted on the spot. Yes, that's right, love at first sight. 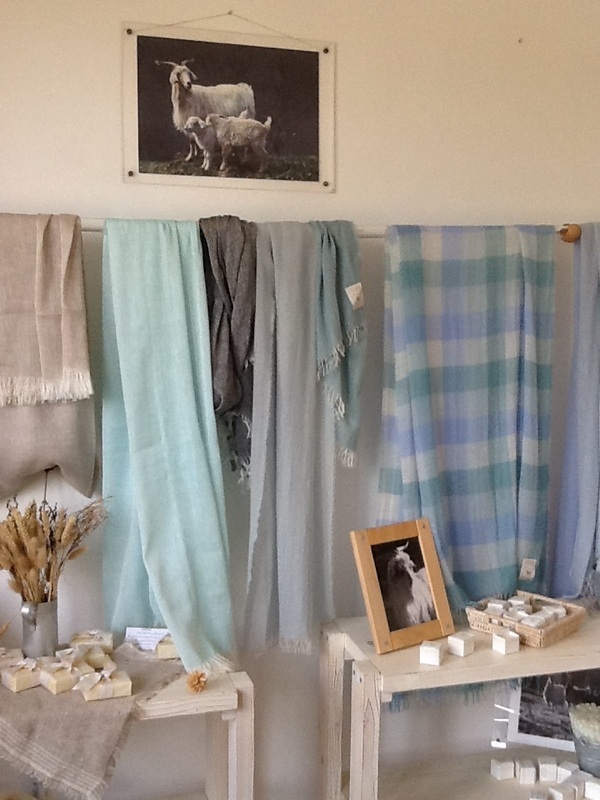 We rambled around feeding the adult goats and petting these enormous Maremma Sheppard dogs and then made our way back to the cashmere store where the woven scarves and blankets felt like creamy silk between my fingertips. The next day we participated in a one-day workshop where we learned about cashmere goats, their habitat, care and quality characteristics of cashmere wool. We had hands-on training on combing and the most adorable sight was when the baby started to cry because we were grooming her mother. Nora scooped the kid up and placed it into the guest's arms so she could sit close to her mom while the guest's partner continued to comb her. That baby goat stayed there for an hour! This has been the most beautiful experience I've had in all my years in Italy, and I have had many. It is no longer just a Bucket List item, it is something I can see myself committing to returning year after year. When I woke from my bed, the view from the bedroom window was something you imagine only exists in a film. The rental house is well equipped with three bedrooms, two bathrooms, a kitchen, living room and screened windows. There's an in-ground pool just below the terrace and the sounds of bells, barks and baaaa in splendid surround sound. If you're an animal lover like me, with a secret crush on all things as soft as cashmere, then this is your paradise. The Chianti wine and wild boar stew at nearby village restaurants are just the cherry on top!